SHANGHAI, Oct. 25, 2018 /PRNewswire/ — The first China International Import Expo (CIIE) is to gather 2800 companies from over 130 countries and regions to meet with over 150,000 buyers in Shanghai from Nov 5 to 10, 2018. In addition to over 200 industry-leading companies who are to display, many exhibitors of CIIE 2018 come from G20 member states as well as countries with links to the Belt and Road Initiative. Geared toward opening China’s consumer market, more than 100 companies from 30+ African countries will also attend. “CIIE provides an excellent opportunity for exhibitors to go beyond the norm and to expand the status-quo of current trading levels. It also gives developing countries an opportunity to engage with Chinese companies and showcase their products. At CIIE I am sure we will witness new trends in trade and cooperation emerge,” said Sun Chenghai, Deputy Director-General of the China International Import Expo Bureau and President of the National Exhibition and Convention Center (Shanghai). “Britain has a reputation for being strong in the creative industry, education and financial services. But Chinese consumers see less of some of its high-end manufacturing, aerospace, automotive products. We hope that CIIE can be a good opportunity for Chinese consumers to see some of the very best British products from a variety of different industries,” said John Edwards, British Consul-General in Shanghai. Exhibitors including Germany, France and Russia were eager to join the world-first event. Delegates from Russia, who will host a “Russian exporters” fringe event with 2000 square meters of products from several industries. Germany will provide the expo with its largest exhibit – A 200-tonne milling machine provided by Waldrich Coburg. Trade envoys from the Republic of Korea will also be looking to expand opportunities beyond traditional sectors such as the lucrative USD 4.96 billion a year cosmetic industry to higher-value sectors. 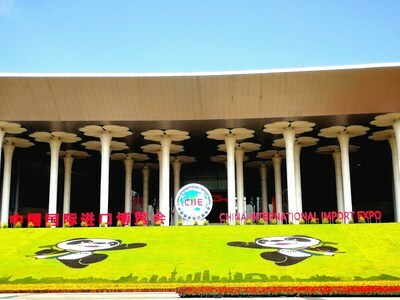 China International Import Expo (CIIE), organized by China International Import Expo bureau and the National Exhibition and Convention Center (Shanghai) Co., Ltd, is jointly sponsored by the Ministry of Commerce of the People’s Republic of China and the Shanghai Municipal People’s Government. As the first exhibition of its kind, it is supported by international organizations including the WTO, UNCTAD, and UNIDO.